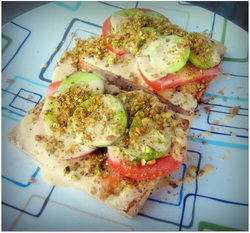 The flavor of this was never in question, but attempting to get crushed pistachios onto tofu is darn-near impossible. So I kept the flavors but conceptually, went from a katsu-style tofu to a grilled stack of of a lot of different textures and tastes in a single bite. Much improved especially using fresh vegetables. Cut the tofu and let it sit for about 15 minutes to let some of the water drain out. While letting the tofu drain, toss the pistachios in the food processor and grind them up so they are the texture of bread crumbs, about 20 seconds. Mix together shoyu and the citrus. Marinate the tofu steaks in a 9 x 9 pan for about 30 minutes, flipping them once. Add a few dollops of mayonnaise to the shoyu/citrus sauce and mix well. Because tofu isn't raw meat there is no health risk of using this as a sauce. Mix well to form a khaki-colored sauce. Drizzle some of the shoyu/citrus/mayo sauce on a place. Sprinkle some of the crushed pistachios on top. Place grilled tofu on top of this mixture. Repeat shoyu drizzle and pistachio sprinkle over the tofu. Place sliced tomatoes and cucumbers on top. Repeat shoyu drizzle and pistachio sprinkle. Pistachio crumbs as panko are not very effective.